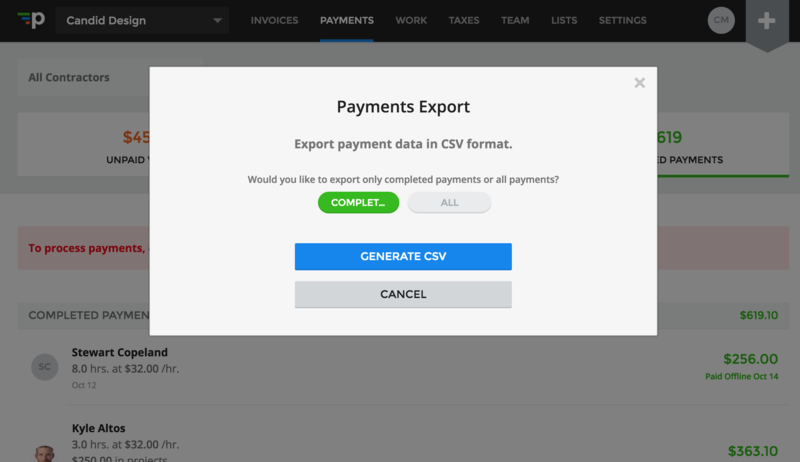 Tap on "Generate CSV" so we can start generating your Payments CSV file. When your download is ready, we will provide you with the link, or in a notification at the bottom of your screen. We will also email a secure link to you, so feel free to leave the app while we are generating your payments export. Here is a sample file of the generated CSV: Payable Payments Sample CSV. The ID of the payment in the Payable system. The ID of the worker in the Payable system. The unique ID of the worker in your system. The worker's first and last name. The total amount of the payment, excluding any transaction fees. The portion of the transaction fee paid by you, the company. The amount that will appear on your company's bank statement for the transaction. The portion of the transaction fee paid by the worker. The amount that was paid to your worker. The amounts for each work type on the payment. Eg: Hours, Expenses. The sum of all flat rate amounts on the payment. The status of the payment. Eg: Paid, Draft Ready. The beginning of the pay period, or the date of the oldest work entry on the payment. Does not apply to Flat Rate Payments. The end of the pay period, or the date of the most recent work entry on the payment. Does not apply to Flat Rate Payments. Date when the payment was sent to your worker. Date the payment was debited from your company bank account. Only applies to ACH transactions. Date when the payment was sent to your contractor's bank account, or the expected arrival date of a mailed check. 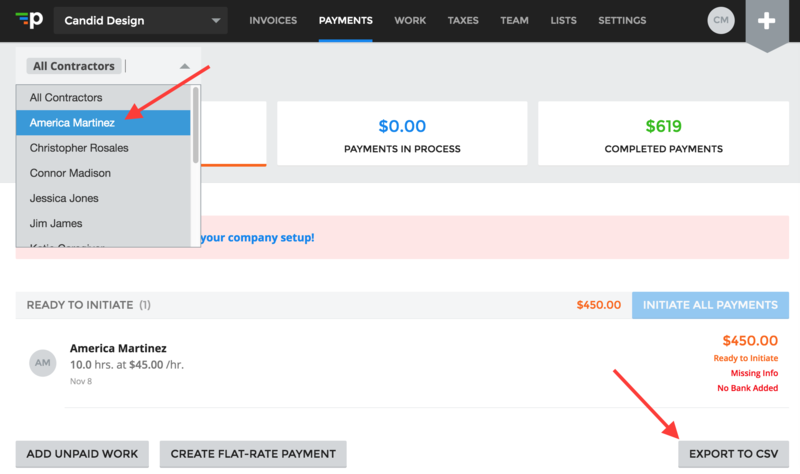 The payment method used to pay your worker. Eg: ACH, Check. The number of the check that was mailed to your worker. Only applies to Mailed Check transactions. Freeform notes associated with the payment. 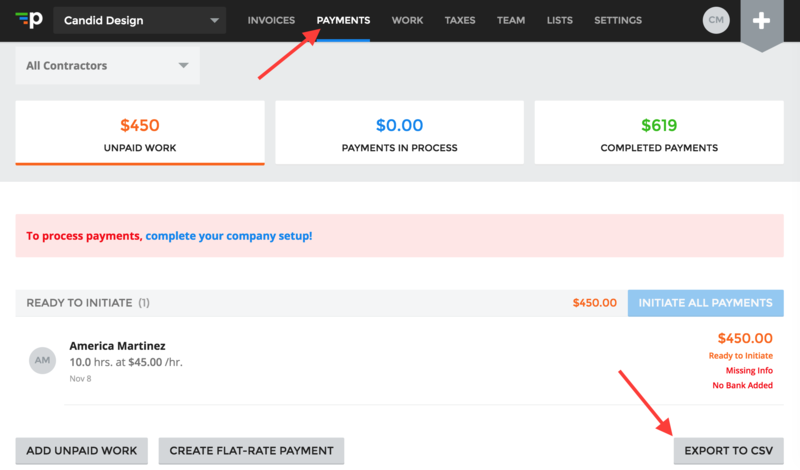 If you have any further questions about the information in the Payments export, feel free to reach out to support@payable.com.